This blog is about things I like and enjoy, I leave the ranting to the pub and my mates, but this post is about something that I love that has invoked deep anger and sadness within me. When do you become aware of art? and when does this art have a context that makes you think about things? when does it awaken curiosity within you and make you want to ask questions about your history, your surroundings, your sense of place that will have a profound affect on you and your make up? In Newport there is an underwhelming concrete public square that long ago when I lived there linked the bus station, and a car park through to the main shopping street. It contained a small public art gallery in one corner and a sports shop where I was taken whenever I needed new boots or kit. It was not and I suspect never has been a gleaming element of the public realm but John Frost Square was an essential part of the make up of the town. In one corner there was a subway that took you out of or into the square, a subway that smelt very much as subways did and always have done but in this unlikely setting there existed the most astonishing piece of public art you could wish to see, a mural depicting the Chartist uprising in Newport in 1839 led by John Frost after which the square was named. Newport is a tough working class town, part of South Wales which itself is a tough working class place that helped fuel the industrial revolution through coal and steel with the coastal ports like Newport having large docks shipping the fruits of this hard labour across the world. Of course the workers did not exactly get rich off this industry but fought long and hard for better conditions, for union rights and for universal suffrage epitomised by the Chartists. This combustible mixture of tough people and tough conditions saw many confrontations, strikes and at times open rebellion such as at Merthyr in 1831 and of course once the right to vote was finally won many a firebrand politician has risen from South Wales to play a significant role in the wider county, perhaps none more so than Nye Bevan founder of the NHS. I knew nothing of this growing up as a kid but I became interested over time through that mural in a subway. It made me ask questions, what was going on, why were people being killed, who were the people marching with pitchforks etc. 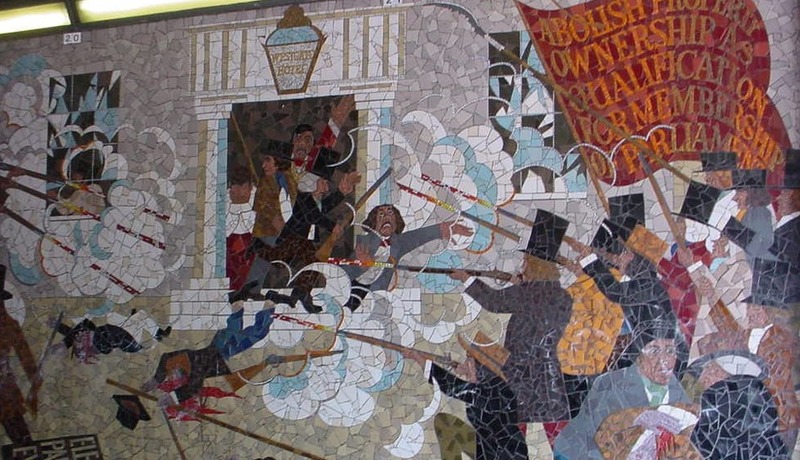 Turns out that they were Chartists being led by John Frost who was the mayor of Newport before being forced out of office for his radical views. 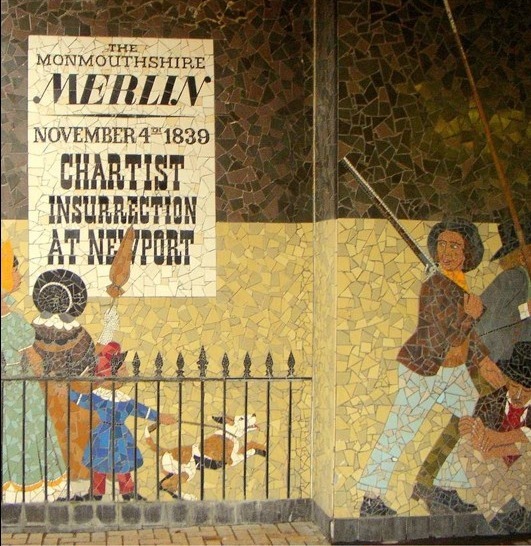 He led 3,000 people in an uprising and marched into Newport to try to free some Chartists being held captive in the town’s Westgate Hotel. 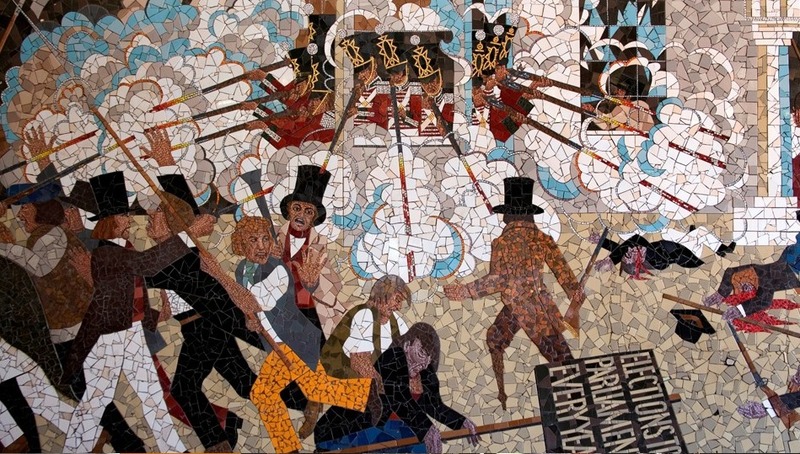 Soldiers in the hotel opened fire and killed 22 Chartists and many others were wounded in the bloody mayhem. Frost was captured and convicted of treason and sentenced to be hung, drawn and quartered which was later commuted to transportation although he eventually returned to Britain where he remained an active campaigner for political reform before he died at the ripe old age of 93. 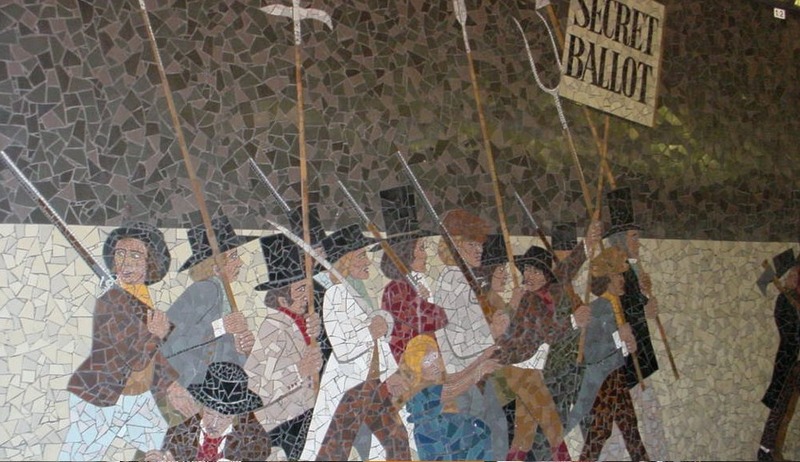 The mural in the subway depicted the Chartist rising in Newport and was the first piece of art that I really became aware of and it showed for me the power and importance that public art can have. 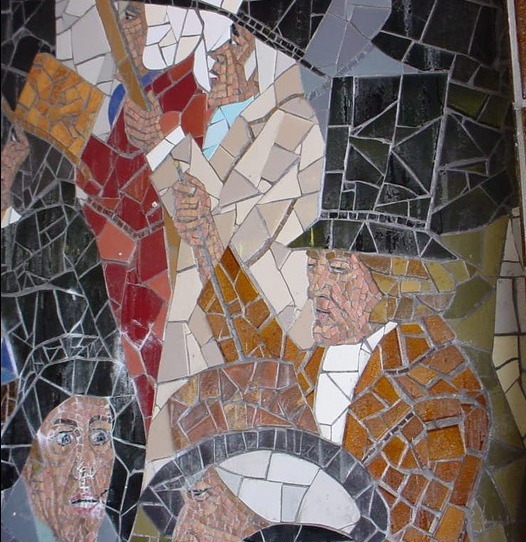 It stood 115ft long and was made up of over 200,000 individual pieces of tile and glass created by the artist Kenneth Budd and completed in 1978. It now lies in piles of rubble, smashed to pieces by the local council who have demolished it to make way for the revamp of the area and a new shopping centre. Oh the irony. A demonstration was planned this weekend against the destruction but the council didn’t wait for that and knocked it down during the week. The mural will never return a beautiful piece of public art that depicted a key moment in the nations history gone forever. No other little kids will wander past holding their mums hand and wondering what was being depicted in those 200,000 pieces. While art is being sold for millions to hang in galleries and people swoon in their thousands to the new temples of architecture that house them no one could turn an eye or bring some cash to a small forgotten subway in South Wales. This makes me angry and sad. The new shopping centre will cost millions and millions but it will be built upon the smashed ruins of the mural. Wonder what John Frost would have made of it all. Some progress. That really, really boils my beans.